Clothing bare walls and structures brings height and structure to a garden but can be a challenge. Choosing the right plant can save you seasons of frustration and disappointment if the plant’s behaviour falls short of your expectations. You tend to grow fewer climbers and they are more prominent in the garden so you do not have the same opportunities for experimentation that you would with herbaceous plants and shrubs. Plus if you are growing them for privacy or as a screen for something ugly, you really want to try and get it right first time. At a recent meeting of industry colleagues, we swapped our experiences and knowledge of climbing plants and I thought I would share that information here for anyone who is looking for some ideas. Let’s dive in with the big favourites. Roses and Clematis. Not only are these popular individually, but also grown together they can provide very lovely coverage for arches and pergolas. In terms of Roses, our favourites include Rosa ‘Zephirine Drouhin’, a dusky pink thornless variety with double pink flowers in the summer and autumn. ‘Etoile de Holland’ is the classic red climbing rose, although not terribly vigorous. On the other end of this spectrum is Rosa ‘Rambling Rector’, which can take off and be a lot to handle, but the fragrance and quantity of blooms make up for that in the right place. If you have a large wall or gateway to cover – this is the ideal solution! Two points of advice: Red roses look perferct on a west facing wall where they can catch the evening sun (a tip from Christopher Lloyd) and choosing roses with simple flowers can give you a longer blooming season as they collect less rain water, and hence do not rot as quickly. If you are looking for something with long lasting blooms, Clematis Wisley may be the one for you. A group 3 clematis, this is a vigorous climber with gorgeous indigo flowers which bloom from early summer to autumn providing late colour in the garden. It tolerates partial shade and is lovely mixed with roses. A more disappointing Clematis it was agreed, is Avalanche, a glossy evergreen with lovely crinkly, divided leaves and smothered in pretty white flowers in May. Unfortunately, despite it being described as hardy and tolerant of exposed positions, none of us had any success with it except when protected by a warm wall in a south or south-west-facing position. Then it is lovely! The foliage does suffer quite badly in the cold wet winters we have here in the west of Scotland. An alternative to an evergreen clematis is the evergreen honeysuckle, Lonicera alseuosmoides which is very hardy. This is a good alternative to the tricksy Clematis armandii which is hard to grow in Scotland, except in a sheltered, sunny position.Lonicera henryi is another evergreen that looks similar to a Kiwi, with slender dark green leaves but is more hardy ( although requires a sheltered spot).Lonicera periclymenum ‘Graham Thomas’ is another favourite. Deciduous, it has a long flowering period over the summer with white fragrant flowers which eventually turn yellow. Parthenocissus tricuspidata or Boston Ivy deserves a mention. This ivy has a large coverage, will grow in almost any aspect and turns a brilliant crimson in autumn, so it’s great for clothing walls. A common mistake is to plant the qincquefolia variety as a climber, where the tricuspidata is a much better choice. Ivies, of course, are the classic climbers but elicit much suspicion from wary gardeners. I think this is a shame as they are such a valuable addition to a garden when used correctly. Ivies also provide a fantastic environment for wildlife in the garden, and contrary to common belief will not kill trees unless they are allowed to completely smother the canopy. On a sound wall or structure they will not cause damage. This only occurs if their woody tendrils are able to breech rotten timber or get into crumbling mortar. End of lecture. 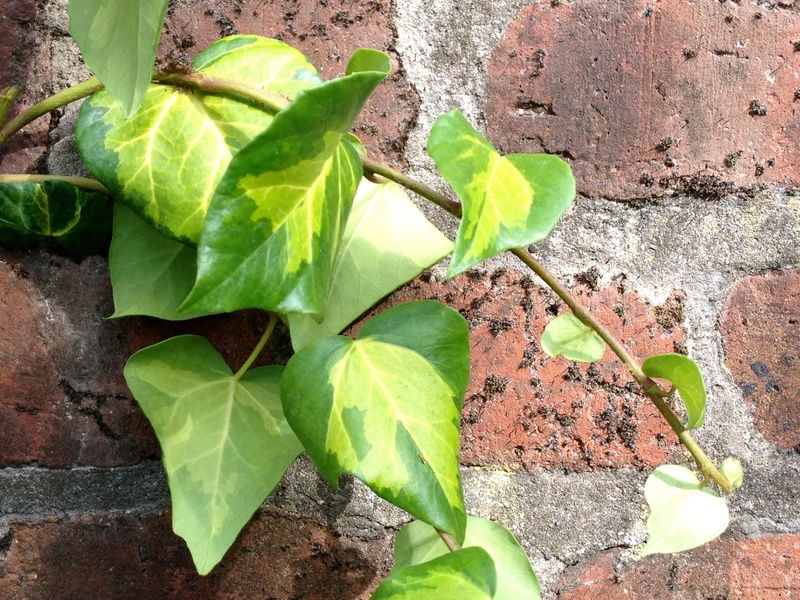 Our favourite ivies include Hedera helix ‘Goldheart’ and Hedera colchica ‘Sulphur Heart’. Both are large -leaved ivies with beautiful colourings. They can be slow to start – but ultimately very structural and handsome. Euonymus can be used as a wall shrub alongside ivies for interest at ground level. Hydrangea anomala subsp. petiolaris is always a popular choice for clothing large expanses of wall, and will grow happily in shade and dry conditions. It requires initial support, but clings onto walls with aerial roots. Pileostagea viburnoides, another climbing Hydrangea often called the evergreen hydrangea, looks more like a viburnum and likes shade.It has long leathery leaves and creamy flowers with a great fragrance. A slow-grower! Celastrus orbiculatus is a hardy woody vine native to East Asia and of the Celastraceae family. It is commonly called Oriental bittersweet. It has rounded green leaves and produces yellow berries which split open to reveal pretty red seeds. In some sites it can become invasive, so plant with care. Codonopsis clematidea is a genus of flowering plant within the family Campanulaceae. It is a small climber which produces pale-blue bell flowers with dark purple markings inside and very pretty. Wisteria is a popular garden addition, but you can be waiting for many years for it to bloom. I bought a small specimen which I planted into my garden when I moved here. It took eight years to produce flowers, although it is now a lovely and reliable treat to look forward to in early summer. Our tip is to buy plants in bloom so you can be sure that your plant is mature enough to flower. Berberidopsis coralina is another evergreen climber which grows in shade, but dislikes wind. It grows to around 5m and has pendulous pink flowers. This is good in an acid soil. Lapageria rosea – the Chilean bellflower – is also a plant for an acid to neutral soil in partial shade. It is half-hardy, and requires a sheltered spot and some winter protection. However, it is unusual and gorgeous with long waxy pink bell-shaped flowers and leathery evergreen foliage which grows to a maximum of 4m. Tropolaeum speciosum – the Flame Creeper is one of those wild and defiant plants which add a touch of spice to a garden. It will scramble up an ivy, or over small trees and produces small bright scarlet nasturtium-type flowers. Also suitable for acid to neutral soils in partial shade, I think this is a brilliant addition for a splash of colour. Jasminum officinale is the ever-popular, evergreen climber with small fragrant white flowers. It is fast-growing and will cope with shade, but requires a sheltered spot and will be most fragrant if placed in a sunny spot. And finally Humulus lupulus ‘Aureus’ or Hops! 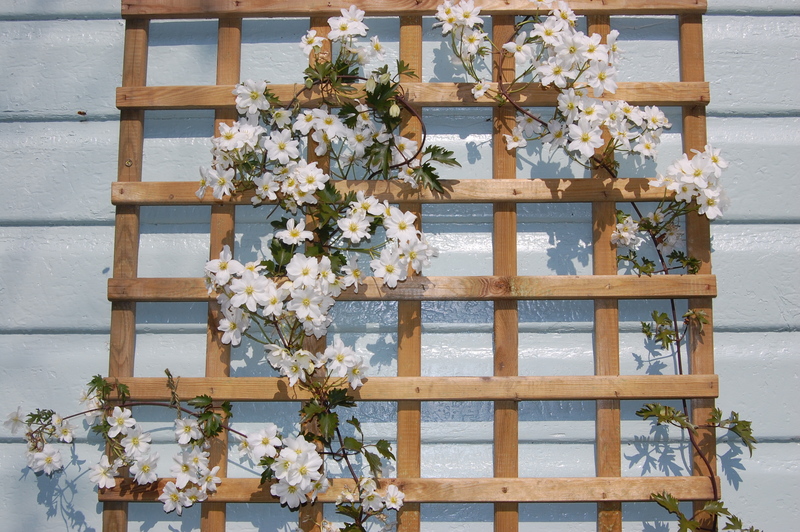 These are often grown over structures in the sunshine and are vigorous climbers with fragrant flowers. An attractive deeply-lobed golden leaf, this climber will grow to 8m and is grown mainly for it’s foliage, although the hops are commonly used decoratively. It is a hardy plant requiring a moist soil. So – that’s it! Quite a list and lots of ideas. If you have any other tips or good combinations, please comment, especially with anything which will suit our Scottish climate!